This is my never fail easy-to-follow toasted hamburger bun recipe. There are a number of ways to toast hamburger buns, but for me the easiest way is on the stove. 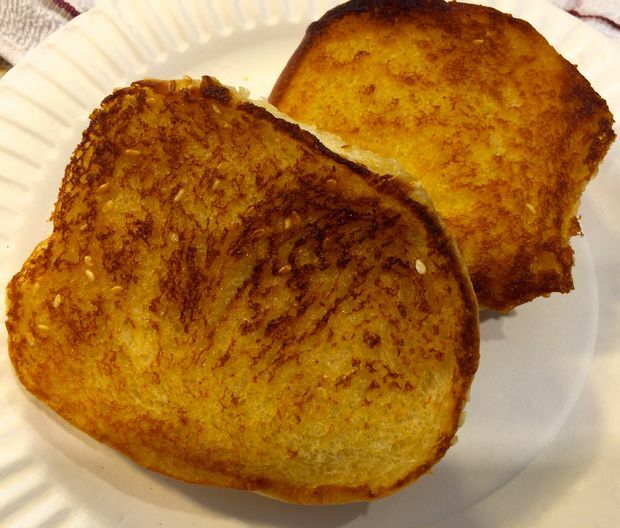 Toasted buns make any sandwich or burger taste better - or just serve them alongside a meal for your bread. A fun side with Cheeseburger Soup. Dovetailing Tip: Use the Focaccia Cloud Bread to toast instead of buying buns. Put a medium sized skillet on a stove burner set to “Medium” heat. * Don’t use a higher heat setting. Higher heat causes the bun to brown or burn quickly. Allow the pan to heat for approximately 30 seconds. Melt the butter. Split open the bun and brush melted butter over the cut sides of both halves. * Make sure to coat the entire cut side, including the edges, doing so helps the edges from burning. Add two buns to skillet, toasting only cut sides of buns. Toast, without moving, until both cut surfaces turn light golden brown. Check the buns after 9-11 seconds. If when checking, the bun is too light, continue toasting, and toast to desired doneness. * Don't leave the stove, and keep checking to avoid buns from burning !!!!! Remove buns from the pan and use it immediately. Or toast buns 30 minutes to 1 hour ahead of time , simply cover with a warm towel (helps to keep buns from drying out) until ready to use.